THE PLAYING FIELD. The field shall be laid out according to the instructions below, supplemented by Diagrams No. 1, No. 2 and No. 3. The infield shall be a 90 foot square. The outfield shall be the area between two foul lines formed by extending two sides of the square, as in Diagram 1. The distance from home base to the nearest fence, stand or other obstruction on fair territory shall be 250 feet or more. A distance of 320 feet or more along the foul lines, and 400 feet or more to center field is preferable. The infield shall be graded so that the base lines and home plate are level. The pitcher's plate shall be 10 inches above the level of home plate. The degree of slope from a point 6 inches in front of the pitcher's plate to a point 6 feet toward home plate shall be 1 inch to 1 foot, and such degree of slope shall be uniform. The infield and outfield, including the boundary lines, are fair territory and all other area is foul territory. It is desirable that the line from home base through the pitchers plate to second base shall run East Northeast. It is recommended that the distance from home base to the backstop, and from the base lines to the nearest fence, stand or other obstruction on foul territory shall be 60 feet or more. See Diagram 1. When location of home base is determined, with a steel tape measure 127 feet, 3 3/8 inches in desired direction to establish second base. From home base, measure 90 feet toward first base; from second base, measure 90 feet toward first base; the intersection of these lines establishes first base. 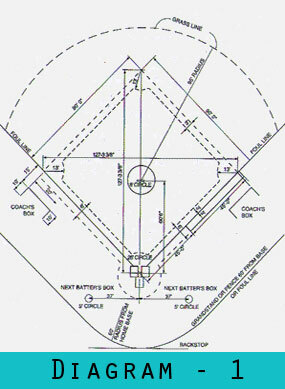 From home base, measure 90 feet toward third base; from second base, measure 90 feet toward third base; the intersection of these lines establishes third base. The distance between first base and third base is 127 feet, 3 3/8 inches. All measurements from home base shall be taken from the point where the first and third base lines intersect. 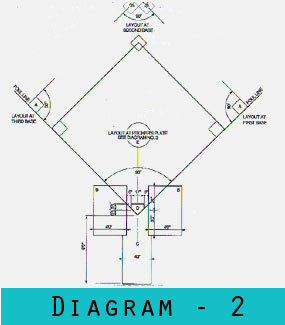 The catcher's box, the batters' boxes, the coaches' boxes, the three foot first base lines and the next batter's boxes shall be laid out as shown in Diagrams 1 and 2. The foul lines and all other playing lines indicated in the diagrams by solid black lines shall be marked with wet, unslaked lime, chalk or other white material. 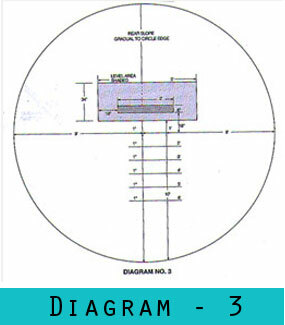 The grass lines and dimensions shown on the diagrams are those used in many fields, but they are not mandatory and each club shall determine the size and shape of the grassed and bare areas of its playing field. NOTE (a) Any Playing Field constructed by a professional club after June 1,1958, shall provide a minimum distance of 325 feet from home base to the nearest fence, stand or other obstruction on the right and left field foul lines, and a minimum distance of 400 feet to the center field fence. (b) No existing playing field shall be remodeled after June 1, 1958, in such manner as to reduce the distance from home base to the foul poles and to the center field fence below the minimum specified in paragraph (a) above.